One of Vietnam’s longest imprisoned political prisoners, Nguyen Huu Cau, 67, was granted a presidential amnesty and released from prison on March 21, 2014, after almost 37 years’ in Vietnam’s prisons and re-education camps. Born in Kien Giang province in the Mekong Delta, Cau was a captain in the Army of the Republic of Vietnam (ARVN, or South Vietnamese army), and spent five years in re-education camp after 1975. 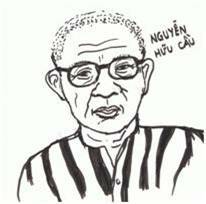 In October 1982, Cau was arrested on charges of “sabotage” for a collection of poetry and songs he had written in the 1970s, which authorities alleged carried anti-communist and reactionary content, and for a letter he wrote alleging corrupt practices by the Chief Prosecutor and the Vice Chairman of the People’s Committee in Kien Giang province. Prosecuting Cau’s case in 1982 was Kien Giang’s Chief Prosecutor, who Cau had accused of corruption. Cau was tried and convicted for carrying out "reactionary" and “destructive” activities [phản đông, "phá hoại] and sentenced to death. In 1985 his sentence was reduced upon appeal to life imprisonment. He was sent to the remote U Minh Prison in the Mekong Delta and then to Z30A Prison in Xuan Loc province, where he was held in the “Confined Section” (K2). Throughout his many years in prison, Cau maintained his innocence and refused to write or sign a confession stating that he was guilty. Instead Cau sent more than 500 letters to government officials protesting his imprisonment and requesting a re-trial or a hearing before the People’s Supreme Court. For refusing to sign a confession he was shackled in solitary confinement for three years (2003-2007), and – until recently -- he was never considered for early release from prison in a national amnesty. Cau’s plight began to be known in 2010 after his family, and other political prisoners upon their release from Xuan Loc, informed the media and international human rights groups about his case. In recent years Cau’s health began to seriously deteriorate and he lost much of his vision, possibly from toxic smoke from a prison cashew drying plant located near his cell. Upon his release on March 21, 2014, he was hospitalized for several days before moving to his son’s home in Kien Giang. One of the first reporters to break the news of Cau’s release was freelance journalist Truong Minh Duc, who covered Cau’s 1983 trial in Kien Giang. Duc was himself imprisoned in 2007 on political charges (“abusing democratic freedoms”), and met Cau in Xuan Loc Prison in 2008. Journalist and former prisoner of conscience Truong Minh Duc interviews Nguyen Huu Cau in hospital shortly after his release from prison. Photo: Truong Minh Duc, Dan Lam Bao, March 24, 2014. One of more than 500 letters Nguyen Huu Cau sent to government officials since his arrest in 1982 regarding his case. Dated 2010, this is the first page of a two-page letter smuggled out of Xuan Loc Prison by fellow political prisoner Nguyen Bac Truyen upon his release in 2010.